Street Church Ministries feels privileged to be hosting another festival for the homeless, and anyone who is willing to fight for the poor, oppressed and unwanted. This festival will be similar to the last outreach event we did at Christmas, but with a strong emphasis on the cross. 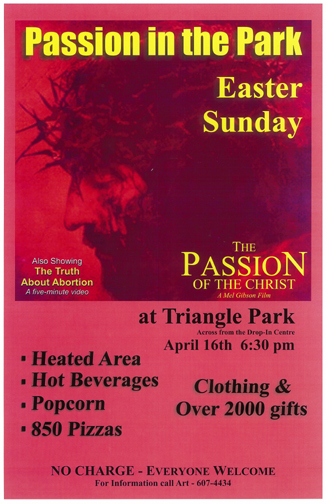 There will be a Theatre play, worship band, movie on the big screen playing The Passion of the Christ (by Mel Gibson) (visit Movie in the Park for more information), a short clip on prolife, the Lord’s supper, and the full gospel will be presented with a call to follow Jesus. We will provide over 1000 slices of pizza, popcorn, beverages, Bibles, Christian books, and we have over 2000 gifts to give away. We also need financial support to help us pay for renting the movie screen, the purchase of food, etc. To volunteer or donate to this festival please email us or call 607-4434.